I'm watching the snow fall on top of nearly eight inches of snow, thinking, "I don't want to drive out in this stuff!" When you have a craving for take-out and it's bad weather outside, make this soup. It's a comfort food that will warm you up from the inside out. I had some of the ingredients in the freezer, which quickly brought this soup together. I used 2 cups of my Costco Roasted chicken stock and made 2 cups of chicken broth from of the McCormicks chicken base. 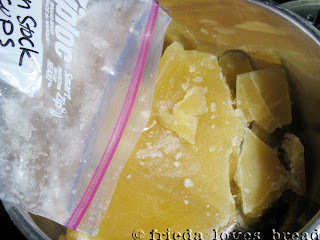 The recipe calls for ground ginger, but I love the taste of fresh ginger. 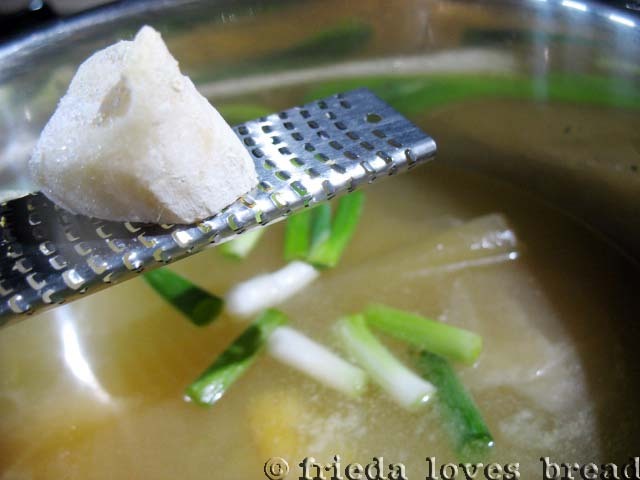 Thanks to having fresh frozen ginger and a microplane, I can easily put this in the soup. 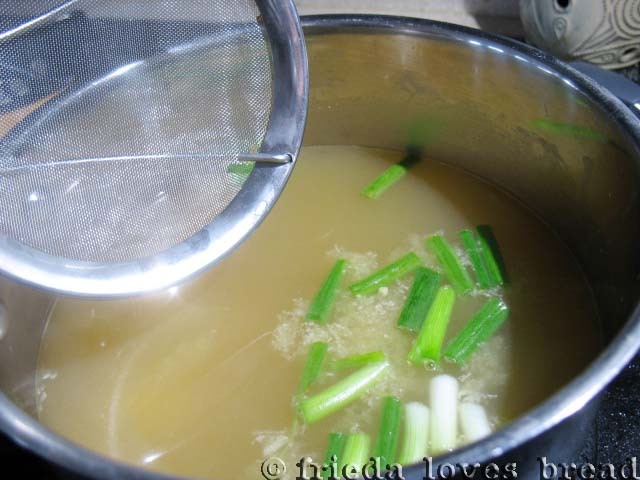 The recipe also calls for fresh chives, which I did not have, but used 2 green onions, cut into 2" pieces for this soup. 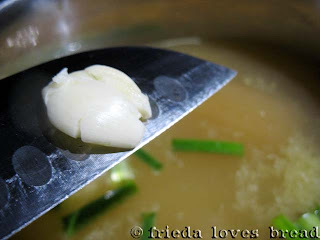 A smashed garlic clove is put in. I also freeze my garlic cloves to keep them fresh. They are so easy to peel when they are frozen. The soup is simmered for a few minutes to allow all the flavors to come together and season the broth. A skimmer/strainer is used to take out the onion and garlic clove. 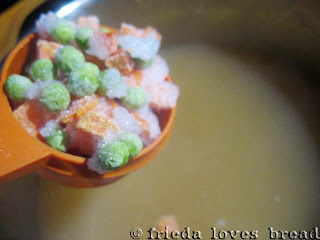 2/3 cup of frozen veggies is all you need. I was supposed to reserve some broth at the beginning to mix with the cornstarch, but since my broth is hot, I mixed it in with a little bit of cold water and stirred it into the broth. 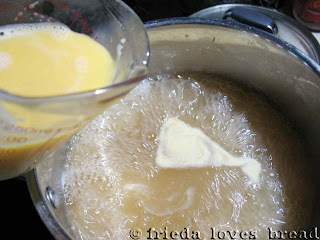 The broth is cooked to the desired consistency and brought to a boil. 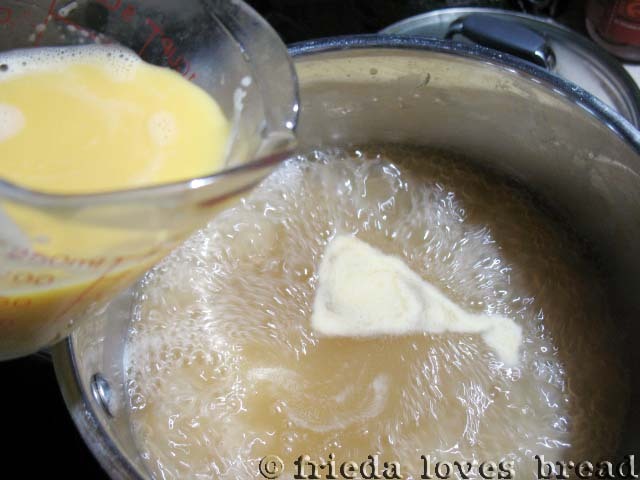 The beaten eggs are put into a measuring cup with a pour spout to drizzle in a slow steady stream over the broth while stirring. I was relieved to fin the veggies in the midst of the eggs! 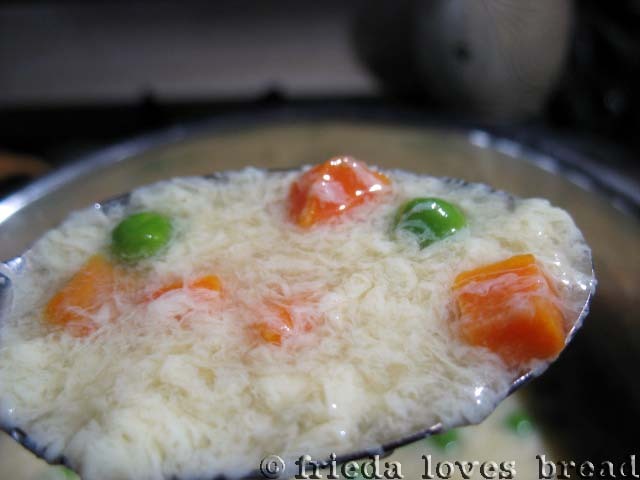 I made this soup for our Valentine's dinner. The first thing my son said was, "This looks different." He is not used to seeing so many eggs in his Egg Drop soup. I'm not either, but hubby loved it! He prefers soups that are not so "brothy." After one bite, it was gobbled up by everyone. It tasted that good. I love frying up some won ton strips and using them in this soup. It acts as a garnish and adds a nice crunch. Next time, I will reduce the eggs and thicken the soup more by adding more cornstarch. The ranges are reflected in the printable recipes, below. Now you can have take-out without going out! 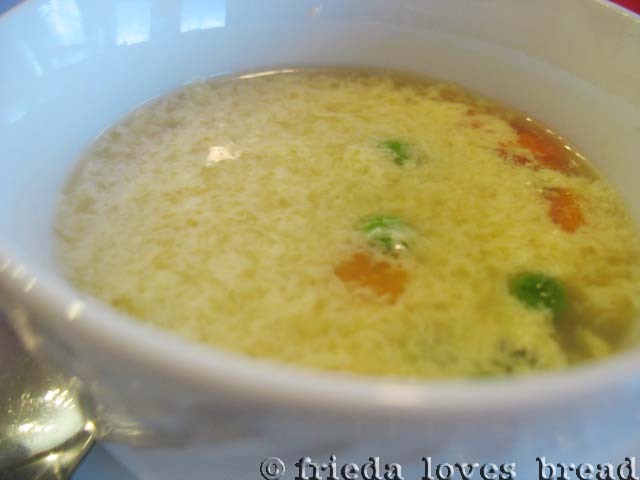 I love egg drop soup, and I absolutely adore your help tips in this tutorial! I would not have ever thought of freezing the garlic cloves and ginger. I'm going to remember to try doing those. Thanks for the excellent recipe (p.s. I have I mentioned how much I LOVE simple and quick recipes? I DO! YUM! 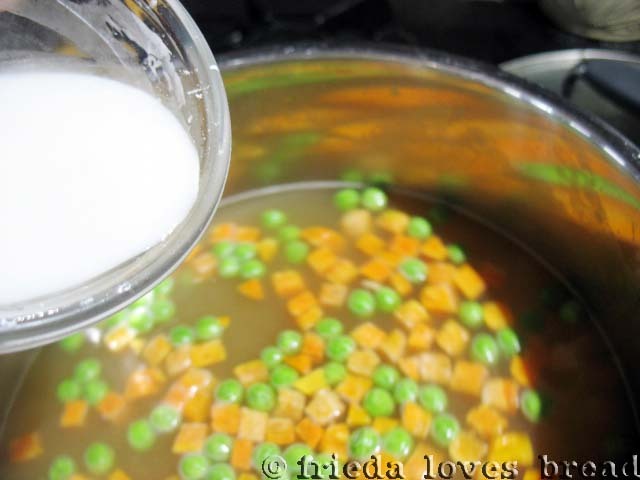 I love eggdrop soup! It's been a while since I've had it and I've never tried to make it myself. Sounds like something I can try! More snow for you? We had some for a few days but it has all melted. Sounds like winter isn't finished with Utah yet. 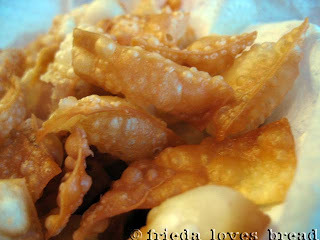 Thanks Frieda for all the nice comments on my blog! I spent yesterday checking yours out and it's wonderful! There is so much information, and many good links to other sites too. Love the tip on turning my bagels over with chopsticks, sounds so much easier than what I did! I'm thinking I will have to try to can some of my chickens this year, since I raise my own this might be quite a project!! 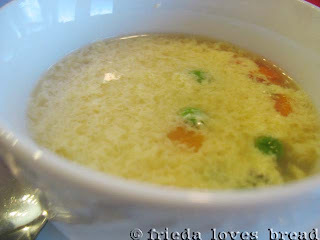 I love egg drop soup...but have never made it! Thanks for a great recipe!